Juicing with herbs is a great way to add flavour and healing properties to your juices. One of my favourite herbs to juice is mint, but the other day I decided to take a break from mint and move over to my parsley patch in my garden and I came up with this super yummy recipe. Parsley is an antioxidant as a result it fights against free radicals that are known to cause cancer in your body. One of the organic compounds in cancer has been shown to inhibit tumour formation and attack oxidized molecules – so it helps to prevent cancer. 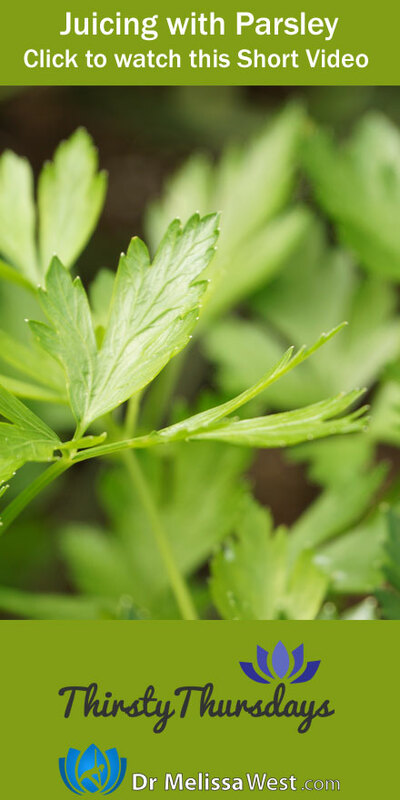 Parsley will aid in digestion and as a diuretic, parsley helps your body expel excess water by flushing your kidneys. Parsley is one of the best sources of vitamin C (it has three times the vitamin C by volume as an orange!) and so it will help to boost your immune system. And just look at that rich green colour, parsley is loaded with chlorophyll.It is important not to take large doses of parsley if you are pregnant because it is a uterine stimulant. Also parsley is contraindicated (meaning you shouldn’t juice it) if you are suffering from kidney inflammation.